But I do love me some Pat Sloan. So I was more than happy to be a part of her latest blog hop in support of QuiltAlbum, a new software package that helps you create a digital story of your quilt creations. You're a quilter, crafter, sewist, or someone very interested in one of these things. You like to take (and share) pictures of your crafty creations. And if that's the case, then you're exactly who QuiltAlbum had in mind when they developed their product. 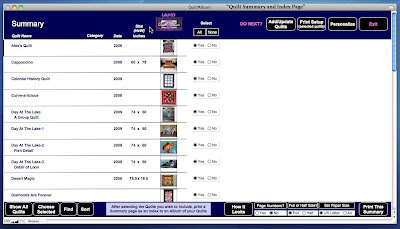 QuiltAlbum is an easy-to-use way to store important information about your quilts – when they were made, who designed them, what methods were used, etc. – and to keep photographs you have taken of your quilts. So you will always have a stored memory of your quilts even if you give them away to family or friends. QuiltAlbum also provides easy tools to print out those photos and information – as pages to be kept in an album (or a three ring binder! ); as greeting cards in a wide variety of formats; or even as images to use on personal business cards you can use with your friends! You have spent many hours creating your quilts. Now you owe it to yourself and your family to create a lasting and complete record. Now, I've installed and played with the software myself. Though I think the interface design is a bit traditional and could stand a few new "skins" to appeal to the younger, modern quilter, the functionality is there. And that's what matters, right? ETA: And yes, it does run on both Mac & PC!! I think it's a fantastic idea for quilters of any age to begin keeping a record to chronicle our quilting journeys. And in today's day and age, digital is the way to go. Think of all the quilts you make and give away as gifts. Don't you want to hold on to the memories of making that quilt? QuiltAlbum offers a powerful, easy-to-use interface for us to begin keeping that electronic record of our creations. Want to learn more? Visit QuiltAlbum on Facebook, or sign up for their newsletter. Sound interesting? Well, I have a copy of QuiltAlbum to give away to one lucky reader. Yeah, that's right -- I have TWO giveaways open on my blog right now. I'm cool like that. Having never done one of Pat's blog hops before, I didn't realize that answering a few fun questions was part of the deal. So, are you ready to get to know a little more about me? What one item do you really want to add to your studio and why? Ever since Anne Sutton of Bunny Hill Designs postedpictures of her quilting studio, I've been dreaming of having a pair (not one, but a pair) of large cutting tables floating in the middle of my studio. Oh, to have that space, storage, and flexibility! My second dream item would be a big closet with a killer built-in storage system. Photo courtesy of Anne Sutton. What color would you paint your living room if you had to do it right now? I would definitely go with a shade of grey. I'm really digging grey right now as my neutral of choice, and I think I've finally convinced Mrs. QD to let me paint a room grey. Does anyone have good suggestions for a specific shade? Share a little know fact about yourself .. with a bit of detail please.. wink! Second, when I worked at Kraft Foods, I starred in several internal sales videos ... dressed as Mr. Peanut. Yup, I donned the Mr. Peanut costume on several occasions. I think I made a great Mr. Peanut! What is the last piece of fabric you bought? Nothing too exciting here. I recently picked up a few yards of Moda Bella solid in the Feather color. I've recently discovered this shade -- somewhere between white and grey -- and I love it. It's going to be the sashing for a quilt I'm working on using Sunkissed. Other recent purchases: charm packs of "Basics" by Basic Grey for Moda, and some of the non-novelty prints of Basic Grey's "Max & Whiskers" line. Oh, and I stocked up on the turquoise and orange grunge fabrics that are part of that line. D'uh ... WINNING! Your favorite candy to find in your Easter Basket? Oh, this one's easy. Cadbury Mini Eggs. Fo' shizzle. While those Cadbury mini eggs are ok...I much prefer the Cadbury Creme eggs. Yummo!!! Oh, be very careful if you paint grey, it's super difficult. Spend the extra money to get one of those small samples to test out. I tried it in my dining room and it came out the color of wet cement. blech! I got a great one for my bedroom, but it's almost white. I forget the color. And those are my fav easter candy too. Those bags last about 2 days around here between all of us! Painted my kitchen something called Pewter (I think) a 2 coat gray that I love.......was sort of thinking paler gray for living room but not sure it gets enough light......too cold? Cadbury Mini Eggs are my all time favorite candy! The program sounds great, but does it run on a Mac? Love your ideas about your studio - I have a giant quilting studio in my mind that will someday (hopefully) become a reality that sounds a lot like yours!! Ok we can have a Showmance anytime my dear freind.. cuz your so darn cute!! Waving to you!! Sarah the QuiltAlbum does run on a mac! Thanks for sharing this giveaway....I would love to win! 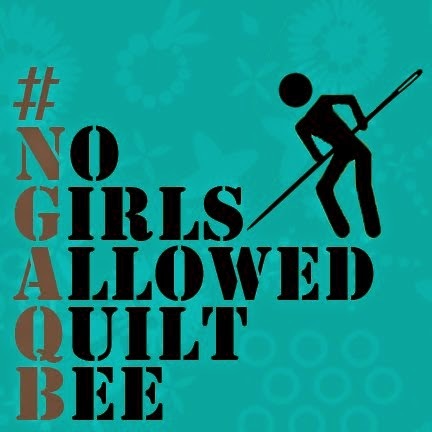 Your blog is a quilter's inspiration for sure!! I painted a large wall in my house the color mountain smoke (valspar, lowes). I chosenthat over a straight up gray, it has just a hint of a warmer tone to it. I felt like I could make it last more with my changing home dec then a standard gray. I agree about the paint samples though it's a big help. I bought a gallon thinking I knew exactly what I wanted and as started putting it on the wall it was way to light. I love color though :-) lots of big color! 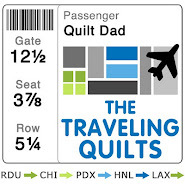 Hi Quilting Dad. I wish I could get my John interested in my quilting. From what I have read about QuiltAlbum it sounds like the perfect program for my geeky side. Thanks for being a part of this Blog Hop! I would love to win the QuiltAlbum. I was just telling my daughter that I wish I had a way to better keep track of the projects I've done. Cadberry mini eggs are the best! Love the combination of yellow and grey. Is there any color grey doesn't look good with? As for the QuiltAlbum software, who wouldn't love the chance to organize the quilt side of our lives? Thanks for the review and giveaway of quilt album! Sounds like in interesting tool! Thanks for sharing! love me some Cadbury eggs too! along with that Quilt Album software, of course! I once painted a bathroom a pale gray - it was called 'moonlight' - just a tinge of silver blue gray.... went with everything! and adam from man vs food. and from henceforth i shall think of you when i see that dancing peanut. HA. Grey is my new favorite right now too. We just painted my sons room in Trophy Silver and it looks fantastic. Hey, who wouldn't love a studio like that? All huge and neat as a pin! lol I'm not so sure about gray. Built a new house...did everything, carpet, counter tops, etc., in grey so that "anything" would go with it. It got old real quick. I love the Cadbury Mini Eggs...I always look for them and the whopper Robin's Eggs at Easter!! snacks for me would be blueberries and red wine! My dining room table + 6 storage containers + My Li'l Singer in a Hard case + 1 large flat portfolio (housing my cutting board plus any WIP too large to fit in a 14" x 14" container) = My Studio! Right now I would be happy with a room of any size where I could actually leave my sewing machine plugged in! That studio does look dreamy though. And I would LOVE to have this software. I am also a photographer, and I have an album in progress (like a wedding album) but it doesn't really "organize" all of the data well. I have photos of everything, but all of my data about each quilt is currently in an excel worksheet... Hardly ideal. I would love to have all that storage/cutting space in my sewing room and the software sounds like a great addition for organizing quilty projects! I quilt program designed for archiving quilt photos?? What a great idea! and I am loving gray right not, especially the gray/yellow combo! I am with you on the Cadbury Eggs thing, addictive. With grey paint, just be mindful of what colors are already in your room because that lovely shade of grey can very easily appear to be a dainty shade of lavender. Dark green definitely helps this effect. Not not only is it great that you quilt, but that you actually dressed up as Mr. Peanut! It was fun reading your interview. Thanks for the chance at this giveaway!! I'm seriously coveting those pottery barn cutting tables. Every time I open their catalog, I drool over those things. This QuiltAlbum looks awesome. I definitely need some way to organize my quilt photos. Thanks for the chance to win. P.S. Sad the Tar Heels are done, but they looked good, huh? I think the Quilt Album could be very cool, if it works on a Mac. Does it let you track your projects as you work on them? It would be great to have a place to track all my UFOs and WIPs as I (hopefully) finish them! I'll check out the new solid you mentions. sounds perfect in lots of projects. The Quiltalbum sounds just like what I need . You are hilarious, QD!! Be sure to show us your grey room when you get one done. My son's bedroom was a blue grey and I totally love the color. Bathroom was once a dove grey, too! Thanks for the chance to win this wonderful software and for participating in this great blog hop!! Please enter me although it may be too complicated for me to use! i'd love to give it a try though! Grey is my very favoritest neutral. i wish i could convince my boyfriend to paint our walls grey. Would love to win and begin recording my quilts. Thank you for the chance. Sweet giveaway! I've been keeping a silly notebook all this time, pfft. Guess I should join 2011, eh? You are silly. I'm glad you reminded me it was April Fool's Day, as it's my grandmother's birthday today! Thanks for yet another giveaway! By the way, I think gray would be an excellent paint choice. I admit to being amused when you said you would paint your living room grey. My house was built in the late 80s, when grey was the "new neutral." In my finished basement, *everything* was grey, the walls, ceiling, carpet, curtains, bathroom fixtures, bathroom tiles -- I couldn't wait to paint it! I want that software so badly!! IT looks like it would be such a help in organizing and remembering your quilts!! Great review! Lots of info in today's post! The software sounds like what I need. Wow - Whats that game - 7 people from Kevin Bacon or something - I think your in. This is a great giveaway! I would love to win the quilt album. What a fun post! I needed a giggle this morning - thanks! Thanks for having a giveaway; the software looks totally awesome! I want floating cutting tables too! First I need a studio.... Great interview! So glad Quilt Album runs on Mac! I use Ravelry for knitting projects and would love to have a sewing/quilting tool, online or on my Mac. thanks! cadbury mini eggs are the BEST...bought the last 2 bags on the grocery store's shelf last night! This software looks great, just what i need to document my quilts. Thanks for a chance to win. I just love grey also. But since my favorite color is blue I tend to go toward the blue/grey scale. You might like Sherwin Williams paints. I like 3 different "greys": 1 - SW6534 Icy; 2 - SW 6535 Solitude and 3 - SW6255 Morning Fog. Loved your post! I think I love this software and really need it!! My long awaited quilt jornal was just waiting for this program. what a fun hop this has been, learning something about everyone. The quilt album is a fantastic program and I would love to have one! Great software...would love to win it. Thanks for having the give away on your blog. Make sure you choose a warm grey, rather than a cool one, per Nate Berkus. Your post was very good. Organized so well. Fun post! I'm excited to see what Pat says about the showmance. Also, I loved the Block a palooza sew along! I would like to win this software. You sure know how to make it sound great. Mini Eggs are the best Easter candy - hands down! I love this idea. Count me in! Please count me in. Love your blog!!!!!!! Thanks for hosting this. It's always fun to learn more about peeps. I wanted to tell you how much I enjoy you blog..your site is very fun and great ideas. Secondly I want to say....I painted my livingroom grey once...it was so depressing that we changed it two weeks later to a brighter color to save our sanity! Oh, I love grey! The home I owned in Tennessee had a grey exterior and it was one of the most beautiful colors. Very soothing. The little computer nerd in me wants that program! I need to be able to keep track of my quilts in an organized way. This looks awesome. Thanks for the chance! Mini-eggs are my favorite too. I like that feather color, way cool. I would also love to be the winner of your copy of Quilt Album. We shall see. I would love to change out my furniture in my sewing room to all built ins and storage units to make it easier to find and put things back. Love this new book, so many wonderful appliques to mix and match. Oh this would be great to help me keep track of the quilts I've made. Every time I see Mr Peanut I'm going to think of you now. ;-) Thanks for the chance! mmm mini eggs...the large costco size bag lasts about 2 days in my house LOL and i have to admit most of them are eaten by me! Thanks for a chance to win - this totally appeals to my inner techie geek. Benjamin Moore Paints has the best shades of gray paint. Although there are so many it's hard to choose! One thing I would like to add to my sewing "studio" is a housekeeper! Help, I need someone to put back all the fabric I take out to audition for a quilt. I would just love to have a little "fairy" come behind me and tidy up what I have messed up. Who said being creative equals neatness anyways! thanks for a chance to win the quilt album. It is fascinating. My living room is brown which I just love. yay! this software looks super cool. Easter candy is far better than Halloween candy. I think it is because it is specific to Easter time and not just candy used to fill a Halloween recepticle. Thanks for the giveaway. I would love a large closet to organinze my sewing and quilting treasures. I have bookmarked your blog so I can come back when I have more time. The software looks great and I love plain old-fashioned jelly beans. I went to high school with A Martinez. He was in the mini-series Centennial and I think on a soap opera. I see his name pop up on a TV show now and then. He was class president of the class before me. And..........the Smothers Brothers went to my HS! Here's my comment: I want to win! LOL Sounds like the feather moda color is the one for your walls. great interview, I love Mr. Peanut, and my mother has a fantastic cutting table made from her old kitchen cabinets and on casters so it rolls and is the perfect height for cutting. I covet that table. Thanks for sharing something about your life. Pat sure can ask some wacky questions;) Thanks for the chance to win a cool prize! I fell in love with the feather color also. Thanks for the give-a-way. Mmmm. I love Mini Eggs too! As a writer and a quilter, sounds like my kind of software. As a candy lover, pass me those eggs! Wooh! Thats a relief, for a moment I thought that you were going to say that you wanted a pretty pink, frilly studio like Anne Sutton, but you are right 2 big cutting benches would be fantastically ideal for any crafty studio. Chocolate, almost any kind would make me happy. Who needs an excuse (like Easter)? I agree with the two cutting tables. There are many times you need that extra room. I like to work on more than one project at a time, and, with 2 tables, you wouldn't have to put one up before working on the other. Please enter me for the software. I'd love to try it out. Oh how I love those mini Cadbury eggs. But then again I love all candy. I really don't think there is any kind that I won't eat. I would really like to win this software. Maybe it would help me be more organized. I would love to win that software, please include my name in the draw. I've been keeping a quilt album since 1997 and last year with yet another move, decided to ditch it as it was taking too much room. Now to have something electronically is a much better idea and very practical for one moving every two to three years. Those cutting tables would be SWEET!! Then I'd have to add a room for my studio so I'd have room. Howdy quilt Dad from another Cary quilter. We buy lots of Cadbury at Easter time but it all has chocolate in it, or on it. Any color of grey/gray with the word slate should look great on a wall. You can never go wrong with Reese's Peanut Butter, no matter the time of year:). I'm with ya on the cutting tables, love them! Thank you for joining in on the fun of this blog hop...like your blog! I would love those big cutting areas with storage too...someday....thanks for the chance to win! I saw that program last week. Looks cool. I wish I could buy it, but I have been indulging my fabriholic tendencies lately and need to slow down the spending. I agree, that studio is awesome! Since I don't eat candy much anymore, I would really like fancy colored hard boiled eggs. And the software sounds interesting but price would be a factor. When we bought our new house last summer, the whole house was painted institutional gray. Sorry, but we felt that we needed to warm it up, so we painted it Shaker Beige. It really looks great! I like Cadbury eggs, and think the new software looks great for my organization of quilt projects. Your Mr. Peanut story is terrific! My son (about your age) is deathly allergic to peanut-anything and has been all his life. So for Halloween this past year he built a spot-on costume of Mr. Peanut (chicken wire and papier-mache) for himself, complete with monocle, spats, hat and cane. If I could, I'd post you a picture of it. He won the costume award, but said that the chicken wire treated him almost as badly as a full-on allergic reaction to peanuts! Too bad I didn't make him a Mr. Peanut quilt (now there's a thought!). It would have made a great entry into Quilt Album, along with his Mr. Peanut costume. I would like a studio--in a new quilt shop of my own!!! i have longed for such thing as this Quilt Album. I'm also a knitter and use Ravelry regularly. I would love to have something similar for sewing but I would very much enjoy this software as a journal of my finished quilts. I would love to have that quilt studio...with a basket of mini cadbury eggs on top! They are my hubbies favorite too. my 'studio' is a corner of a larger multipurpose family room. A real studio would be great but I do have space to call my own! I would love to win the software, it looks like a great tool. Being "old school" the interface and I would get along great. Easter just isn't Easter without Peeps....frozen ones at that. I would like to win this software. I would also love to have a studio like Anne's. Thanks for the chance to win. The Quilt Album is a great idea. Just what I need to get organized! I can't remember Webster. But Mr. Peanut is a cutie. I do meet the criteria for needing this Quilt Album, so I do hope I win. Thank you. I would love to get organized with Quilt Album!!! Great post... thanks for the chance to win! My favorite for Easter is Reese's Peanut Butter Eggs and a few peeps for more sugar! I'd love the QuiltAlbum I am bad about documenting my projects and it sure would help. Wow! That looks like a fantastic program. I know I would love to use it as my quilting journey. I do not document much at all and then give it all away. I've only been quilting for a few years and am currently on my 5th quilt so this would be the PERFECT time to get that software! In other news, your dream sewing room is also mine, as are Cadbury Eggs! its like we're quilting-soulmates LOL :) Love your posts! Thanks! This would do me a world of organizing good. Thanks for the chance to enter. This looks like a great program! Thanks for a chance to win. Must try the Cadbury Minis. Not sure I've ever seen them. Thanks for the chance to win. Love the idea of a way to document my quilts. Thanks for the chance for the give away. BTW, I love jelly bellys in my Easter basket. I would love to get a bernina quilting chair then I could sit all day and quilt! Love your site! Since I have a small cutting table already, I now need a place to store everything. I LOVE those Cadbury mini eggs too! I always buy a "stash" to eat over the next several months when you can no longer get them in the stores:) And I have to say that I'm jealous of Anne Sutton's entire sewing room. Thanks for sharing. Great interview! thanks for the chance! I would love to have the quilt software! What a good method for preserving our art. But I would have to go with Dove Dark Promises as my candy of choice. Hmmm. Grey can be pretty....as long as it doesn't look like the side of an aircraft carrier. They are using it a lot on HGTV these days. I personally like a lavendery grey. With white trim. Delish! Oh. And my computer is in here too...loving the idea of that software! I'll think of you every time I see Planters Peanut! Thanks of the chance to win! I like Reese's Peanut Butter cup Easter eggs. Thanks for the giveaway! I would love to win this software....looks like so much fun...thanks for sharing! Great interview! Great giveaway! Wonderful software! Thank you for sharing and for the giveaway. The more I read about this program, the more useful it looks! Thanks for counting me in. I think that little view into Anne Sutton's sewing room made lots of people start mentally planning, shifting, calculating ... drooling ... it sure did me! Great site! I'm sure you made a wonderful Mr Peanut! Love the fabric on the right...I was actually using it today. Wish me luck Mr. Peanut! My late husband was a defensive lineman for UNC. So, GO HEELS! What an inspiration you are to this old quilter. In a lifetime of quilting, I have never documented any of my quilts. REGRETS!! Never too late to start and this program seems the ticket. For my studio, a huge walk-in closet for storing my lovelies where I can see them but sunlight is not a problem. That fabric on the right is terrific - I gotta figure out what it is! And for me, a definate Whoppers Egg addiction, although I also need my Peeps. Yum! The one addition I'd like in my studio? I table big enough to put my huge cutting mat on it. :) Right now, I do all my rotary cutting, layouts, and ironing on the floor. Thanks for the chance! Grey is also my neutral color of choice ~ both in decorating and fabric choice! Love the cutting tables in the quilting studio ~ a great addition to any quilt studio. Thanks for a chance to win this fantastic organizing software. I would love to win the software, I've been wanting to organize my projects for years but really haven't gotten around to it. It just seems like a huge undertaking, but the software sounds like a godsend. My fave Easter candy are the Sweet tarts that are shaped like bunnies and chicks. The software sounds neat. I could keep track of all my UFO's as well....My daughter is a knitter and she keeps track of all her projects in a binder so maybe this could be helpfuly for her as well. It was neat to hear about Mr. Peanut. It's interesting when people we know become TV stars. I'd like a sewing room big enough for two cutting tables, too. But really I"m just happy I have a room to myself. My mess can be behind closed doors. The software is so darn practical.....how I wish I had it years ago so I could have documented all those quilts that I have given away. Yes, to Anne Sutton's studio is a huge dream of a lot of us quilters.....and all that neatness and order.....divine. Hey, did you see where SewCalGal voters picked Anne as designer of the year? Well deserved Anne congratulations! The program sounds like a great idea, why didn't I think of it? I have a 2'X4' cutting tabel and I love it, except I have a problem with stacking it hight with fabric instead of putting it away. To win this would be phenominal! Thanks very much for the info about Quilt Album-I know I would enjoy using it. I like neutrals for walls so I can show off my quilts! Every grey has a different undertone; we all know that from fabrics-a very light grey with a blue undertone might be calm and cool. I'm signing up for the feed to your blog now since I come to visit often. It sounds like a great program, I'd love to win a copy! Great interview questions! I love learning new and interesting tidbits...Pat Sloan leads quite the colorful life! I hope this is not an april fool joke ;-) - it sounds too good to be true! Just getting back to quilting after many years - it would be so wise to keep track of all the ones I've started and the QuiltAlbum would make it fun and even more creative. Thanks for an inspiring blog and the chance to win. Hope I'm not too late for a chance at the software. How fun! I would love the software. Right now I do my designing on autocad 'cause that is what I have at work and really that is for buildings not quilts. I would love to be entered for a chance to win this software! Thanks for the give away. What a great idea for quilters! Anything to help me be more organized is a plus, and I love the idea of documenting all my quilts, etc. I hope I win! And if the Easter Bunny knows what is good for him he will put hershey's kisses in my basket! Although I did just re-claim the baby's room (no longer a baby) as my sewing/craft room.. just got to get it moved in! Oh so excited! the software looks great! thanks for the opportunity to win. I'd love a sewing room like that too. I would never have dreamed you were Mr. Peanut. Hope I win the Quilt album. I can think of all kinds of uses for it. Thanks for the chance to win what sounds like a great software package. I love the idea of that software. Not that I need one more computer program, but this one I think would be fantastic. Seriously! Thanks for the opportunity. This software sounds awesome!! I would immediately put in my pinwheel quilt that I made for my own bed, copied from the quilt in the movie, "You've Got Mail". I fell in love with that quilt as soon as I saw it. I added a pinwheel border and put the pinwheels on point. Then I would put in all the baby quilts that I have made. After eating many Cadbury mini-eggs!! I would start the software with the next quilt I finish. I really enjoy your color sense. Shade of gray - Riverbed by Dunn Edwards. Has some brown in it. very nice to use with pale blue, or with creamy white. The software idea is Awesome! I am a peeps girl as far as easter candy but I respect your easter candy choice. Love your April Fool's joke. You're funny. Anyway I enjoy your blog and check it often. The QuiltAlbum software sounds wonderful and very easy. Pick me! pick me! I love peeps in all colors! The shades of gray are really nice. Would love to try the QuiltAlbum software! The software idea is awesome!! !